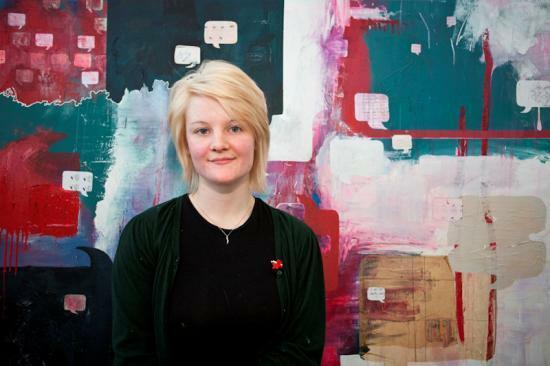 Catherine Redgate (23), a fourth-year Painting student at Robert Gordon University's Gray's School of Art in Aberdeen, has been putting the finishing touches to her work ahead of staging a pre-degree show exhibition in Edinburgh later this month. Catherine, from Castletown near Thurso, and 26 of her classmates are preparing to showcase their final-year work at an exhibition devoted solely to the art school, entitled 'Gray's Contemporaries', at 'art's complex' in the Scottish capital from 19 - 26 February 2011. The exhibition will give the students a vital opportunity to bring their creations to a wider audience outwith the North-east, as well as giving the public in Edinburgh a preview of the work being tested and developed in Aberdeen, before the students exhibit a comprehensive body of their work at the Gray's School of Art Degree Show in June. Catherine, a former Thurso High School pupil, will exhibit her large collage paintings which focus on her obsession with collecting anonymous objects that symbolise our everyday life, highlighting the daily routines of ordinary people. Growing up, Catherine always observed and absorbed the finer details of everyday life that others would pass by, acting as a 'fly on the wall', and now filters these experiences into her work. Her large collage canvases, entitled 'Wake up and smell the eggs' and '1007 fishes', were created using a variety of materials including paint, pencil, sandpaper, tissues and even plastic cutlery! Catherine explains: "The use of repetition in my work illustrates the ongoing ebb and flow of life, highlighting that we should take security and comfort from the fact that we have a daily routine rather than becoming bored with it. I hope to encourage visitors to interact and engage more with their own everyday lives. "The contrast in my work is that the collage looks displaced and unorganised, when in fact it is an amalgamation of my thoughts and collected images. This reflects how I use my work to structure and make sense of my own thoughts to build a story which will hopefully make others aware of their own journeys." Drawn by the seemingly random placement of images within their work, Catherine was inspired by Scandinavian embroiderer, Tilleke Schiele, and successful Gray's graduates Sarah Stanley and Nicola Williams. Catherine continues: "I wanted to address the issue of how you can create a successful, planned piece of art that appears to the viewer to have been haphazardly composed. This work represents my own struggle to stay organised, and to bring order to my sometimes chaotic thoughts. "I'm really excited about exhibiting our work in Edinburgh. The reaction of the public to our exhibit will help steer the direction of our final projects and will also give us valuable experience of displaying our work outside of Gray's." Francis Convery, Head of Painting at the School, adds: "This exhibition is a great platform for our graduating and emerging artists to get wider exposure for their work, which can often be a struggle when working in the North-east. Bringing a show to the capital which reflects the diversity and individuality nurtured at Gray's, hopefully gives the students access to an appreciative public in the Central Belt, and acts as a reminder of the quality of work being produced in Aberdeen." 'Gray's Contemporaries' will run from Saturday 19 to Saturday 26 February, 10am-6pm daily, in Galleries 2 and 3 at 'art's complex', St. Margaret's House, 151 London Road, Edinburgh. The annual Gray's School of Art Degree Show, sponsored by BP, will be held from Friday 17 - Saturday 25 June 2011.